The edge deflection for a 72" Dial Table was estimated for both the Carbon dial table and a steel dial table. Edge deflection was estimated for dial weight alone and three total tool loads of 28, 57 and 113 lbs. Tables at the bottom of each frame show the deflection performance of carbon dial tables compared with a 1" thick steel table. FRAME W shows edge deflection from weight alone of carbon dial tables using materials CFCD001-xxxx-R02, R04 and steel dial tables. 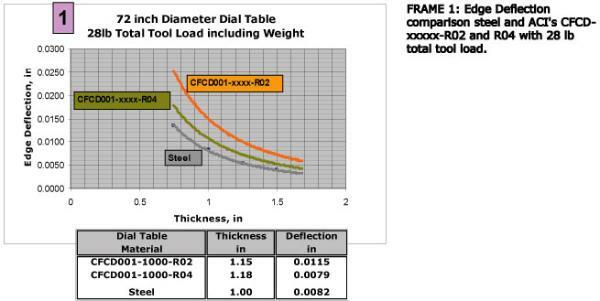 FRAMES 1, 2 and 3 show the estimated edge deflection of a BCDT-07200A Carbon Dial Table manufactured from illstreet's CFCD-xxxx-R02, R04, R08 and R012 materials compared to steel for varying total tool loads (weight included). Edge deflection information provided for comparison purposes only. The information shows that the deflection performance of a Carbon dial table can match the performance of traditional material dial table simply by increasing thickness and it will still come out lighter than the metal counterpart. Specific circular plate edge deflection values can be provided by illstreet.